Description: GG-1 # 4890 passes thru New Brunswick with a westbound train. Description: A general view of the Penn Coach yard at 30th St. station. Note the brand new Penn Central Green box cars in the background! 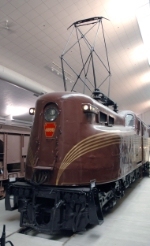 Description: Built in March of 1940, it became PC 4890 in 1968 and Amtrak 4890 in March of 1973. It was then renumbered to 930. 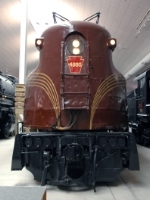 Currently, it is preserved at the National Railroad Museum in Green Bay, WI. Description: Now at Green Bay, WI. Description: I saw many in tuscan red as a kid, but the never looked impressive to me. It sure does now. 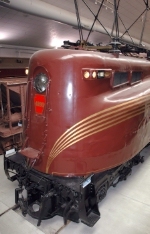 Description: This Electric engine was mainly used in passenger service. Description: The firemans view from the Union Pacific Big Boy steam locomotive.